Citizens opens its first Banking and Wealth Center in Chestnut Hill, Massachusetts. 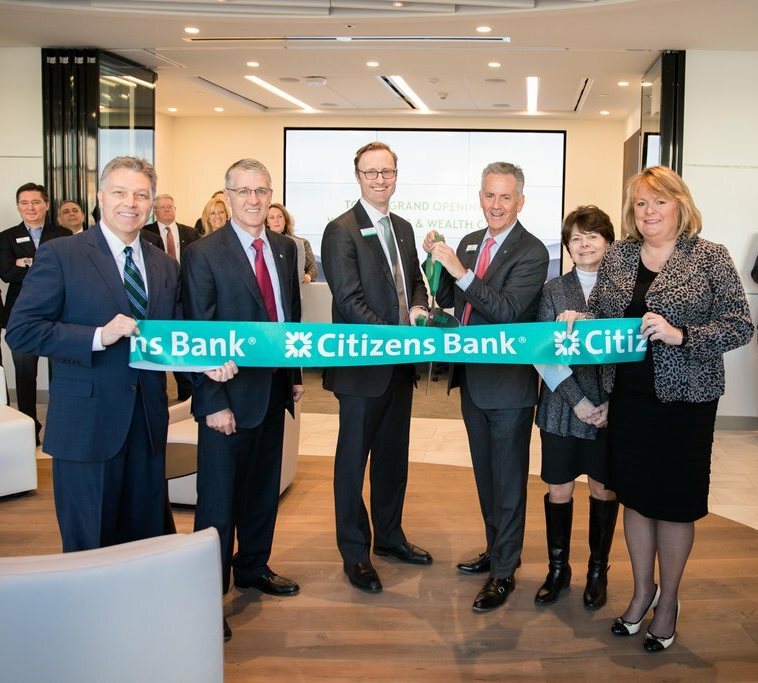 Citizens Bank Wealth Management, in partnership with Distribution, recently celebrated the official grand opening of its first Banking and Wealth Center in Chestnut Hill, Massachusetts on January 25 and January 27. The ribbon cutting ceremony, cocktail reception and open house were attended by Citizens Bank senior leaders, branch colleagues, local dignitaries, clients and guests. In addition to the celebration, Citizens Bank also made donations to the Brookline Food Pantry and Centre Street Food Pantry, each for $3,000.00. This innovative approach to the client experience is designed to meet the needs of Mass Affluent, Affluent and High Net Worth clients. In addition to Wealth professionals—such as Premier Advisors, Private Wealth Advisors and Financial Advisors—the location is also home to Business Bankers, Mortgage Lending colleagues and a full service retail branch. The new location was designed with the client, colleague and community in mind, creating a feeling of expertise, knowledge and credibility for anyone walking through the door. Not only is there space for private client discussions but there is also space for community meetings, events and not for profit organization use. Learn more about life at Citizens and the ways we show our commitment to the communities we work and live in. Banking products are offered through Citizens Bank. Citizens Bank is a brand name of Citizens Bank, N.A. Deposit accounts held at Citizens Bank, N.A., Member FDIC. Securities, Insurance and Investment Advisory Services offered through Citizens Securities, Inc. (“CSI”), also referred to as Citizens Investment Services. CSI is an SEC registered investment adviser and Member - FINRA and SIPC. 770 Legacy Place, MLP240, Dedham, MA 02026. (800) 942-8300. CSI is an affiliate of Citizens Bank, N.A.